In this article on Spanish coffee we look at the history of Spanish coffee and how Spaniards today have integrated coffee into part of their way of life and culture. We also take a look at the various different types of coffee so that when you go into a bar or restaurant in Spain you know what coffee to order. The quality of coffee in Spain is outstanding, this is because of the quality of the coffee bean and the unique way it is roasted and then blended. 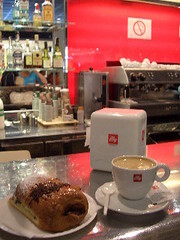 Café Solo – the most commonly ordered type of coffee in Spain. Café solo is a small and very strong black coffee usually served in a small glass. 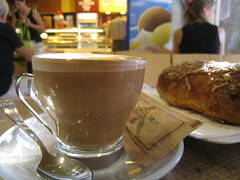 Café Con Leche – is the next most popular way to drink coffee, especially as the first cup of the day. It is half café solo and half hot milk and can be served in a small glass or a tall thin glass. Café con leche is best drunk in a traditional Spanish bar where they pour the milk into a metal jug and then with steam from the espresso machine they noisily froth the milk and heat it up so your coffee will be piping hot! Café Bombon – this is a variant on café con leche, it is a small glass containing condensed milk with a café solo slowly poured in. It is then mixed and is very sweet tasting. Café Americano – similar to a café solo but served in a larger glass or cup with a more water. Café Cortado – a strong black coffee similar to café solo but with a drop of milk. Café Con Hielo – mostly drunk in the summertime this is cold coffee otherwise known as iced coffee. The Spanish will serve you with a ‘normal coffee’ and a separate glass with ice and you should then pour your coffee over the ice. Café Sombra or Café Manchado is mostly milk with just a few drops or small measure of coffee. Café Carajillo – this is the coffee that is famous around the world as ‘Spanish coffee’ although as we have already seen – there are so many other types of coffee in Spain apart from the café carajillo. Outside of Spain we know Spanish coffee as a coffee with alcohol – typically rum then topped with whipped cream. In Spain a traditional café carajillo is a café solo with a small measure of brandy. Alternatively you can have rum or whisky instead. If this is done properly the brandy is lit first so the alcohol burns off then the coffee (solo) is added. When we think of Spanish coffee we tend to think of a steaming mug of coffee with rum or other alcohol and topped with whipped cream, but the Spanish influence on the coffee industry reaches much further than the bar in a ski lodge. Spanish ships carried coffee plants and seeds to many remote areas of the world where coffee was not native but soon became central growing hubs. Descendants of Spanish conquistadors settled in Central and South America where they created huge plantations for growing Spanish coffee. Coffee originally came to Spain with Turkish immigrants. Not much, if any, coffee was actually grown in Spain but they developed a method for roasting that produces very dark, almost black oily beans that make very strong coffee that is known as Spanish Roast, or Dark French Roast. Spanish coffee growers in Latin America accounted for nearly half of all the coffee exported; however, most Spanish coffee served in Spain comes from Angola and Mozambique and is roasted dark to bring out the full flavour. Coffeehouses in Spain are usually elaborate, elegant gathering places with high ceilings, ornate furniture and waiters in white shirts and black ties. The customers are appropriately dressed and the atmosphere is somewhat reserved. Spanish coffee houses are quite different from other regions of the world where a casual, informal environment would be expected. Early Arabic coffee traders tended to gouge the Spanish coffee merchants on pricing and the result was the highest priced cup of coffee in Europe. Portugal, Spain’s neighbour, had colonies in several coffee growing regions in Africa and sold coffee to the Spain at more reasonable prices, however the quality was not as good and some importers chose to pay the higher prices for the Arabian coffee. Whether the Spaniards were the first to add alcohol to coffee is unknown, but this practice is very common in Spanish coffee houses even in the morning hours so it is possible. The familiar drink on cold afternoons does have its origin in the rich and elegant coffeehouses of Spain. Drinking coffee is a way of life in Spain. The Spanish people will typically have a coffee first thing in the morning with their breakfast to get them started for the day. This first cup of coffee is usually accompanied with hot milk, this coffee is known as café con leche. Then at around 11am many Spanish people stop for a short break known as the Almuerzo. Often they order a coffee known as a café solo and they eat a small snack such as a bocadillo which we would know better as a sandwich (made from a baguette) containing cheese or ham. Coffee will also be consumed at lunchtime (Comida) and after dinner (Cena). As you can tell, the Spanish love their coffee and the best way to experience this is in those rundown, rustic and very traditional Spanish bars where you stand at the counter. Almuerzo is sometimes used for lunch, but merienda is never used for brunch in Spain, always for afternoon snack.